On the south side of Prospect Park is a 40-acre superblock that opened shortly after the park and designated as a military parade ground. 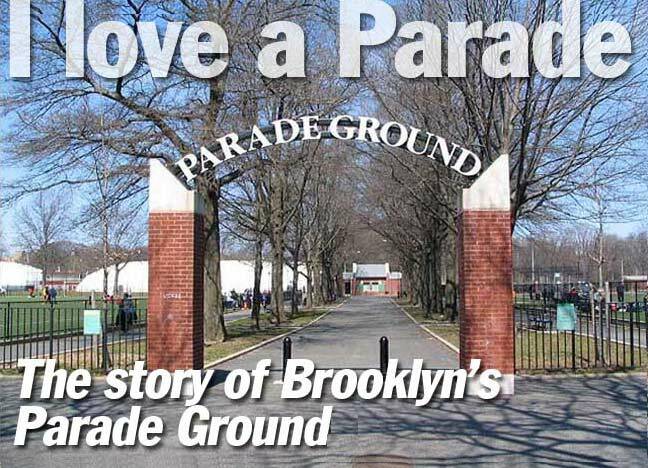 Generations of Brooklynites regard Parade Ground as an incubator of baseball talent, along with tennis, lacrosse, soccer, and football. 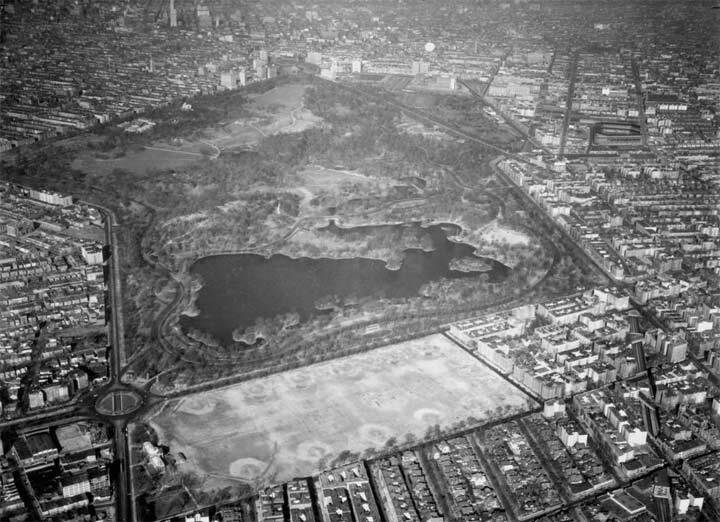 As seen in the 1937 McLaughlin Air Service survey from the Parks Archives, the treeless Parade Ground is the opposite of Prospect Park with its Olmstedian landscape. This addition to the park was designed as a flat expanse ringed by gravel and trees, with a small wooded area along its western edge. On that side of the park was a simple wooden grandstand for reviewing the troops and early baseball games. 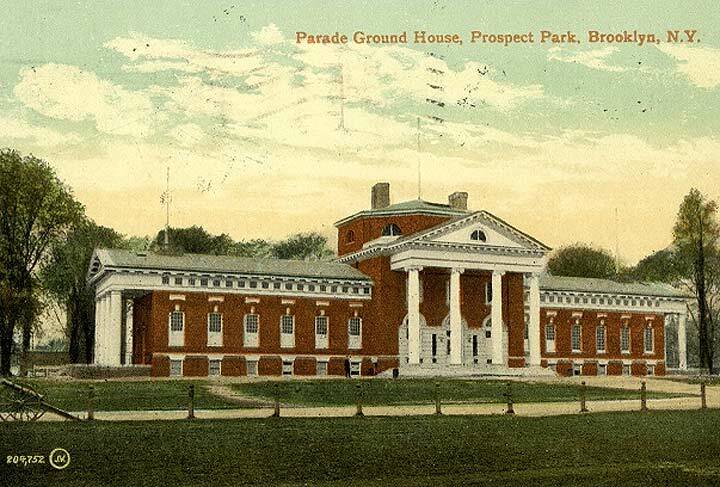 With the help of Prospect Park Alliance Archivist Amy Peck, I was given access to the Prospect Park Archives/Bob Levine Collection, which has historical images of Parade Ground and its now-gone Beaux Arts buildings. 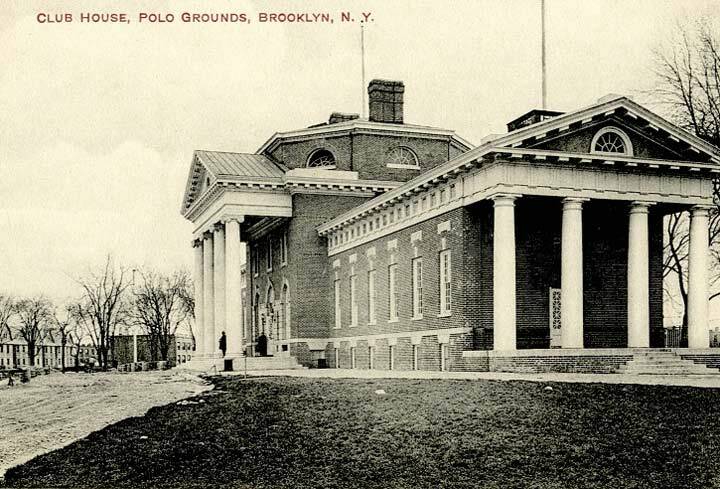 Prospect Park picked up additional buildings at the turn of the 20th century when the architecture firm of Helmle, Huberty & Hudswell designed the park’s Tennis House and Boathouse. At the Parade Ground, their 1905 Athletic Building replaced an Olmstedian wooden lodge. This new field house was a classically-inspired structure with an octagonal rotunda, and four sets of columns topped by pediments. 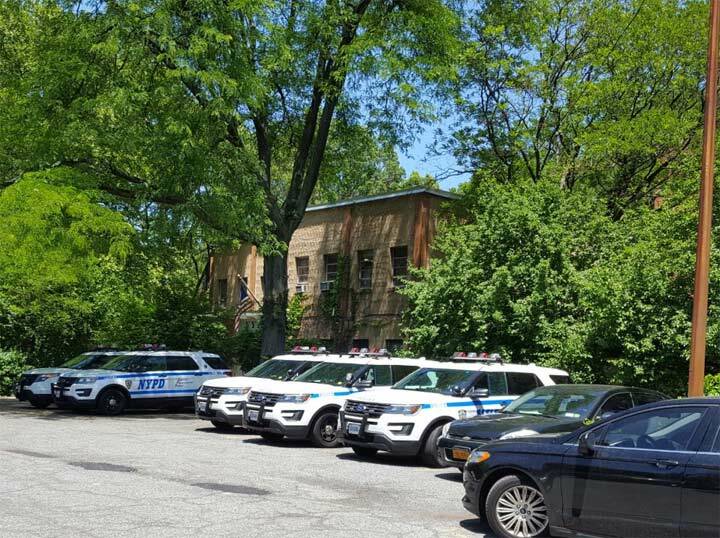 It contained 735 lockers, dressing rooms, police station, and park superintendent’s residence. 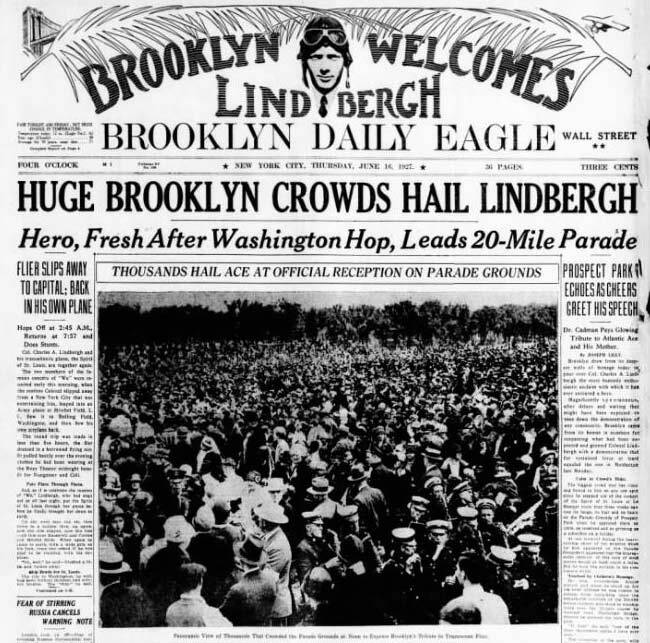 The largest public gathering at Parade Ground was on June 15, 1927, when more than 200,000 people gathered here to welcome pioneering aviator Charles Lindbergh. The Brooklyn Daily Eagle published a commemorative front page for the occasion. A few yards to its south of the Athletic Building was the Parade Ground’s outdoor bowling lawn. 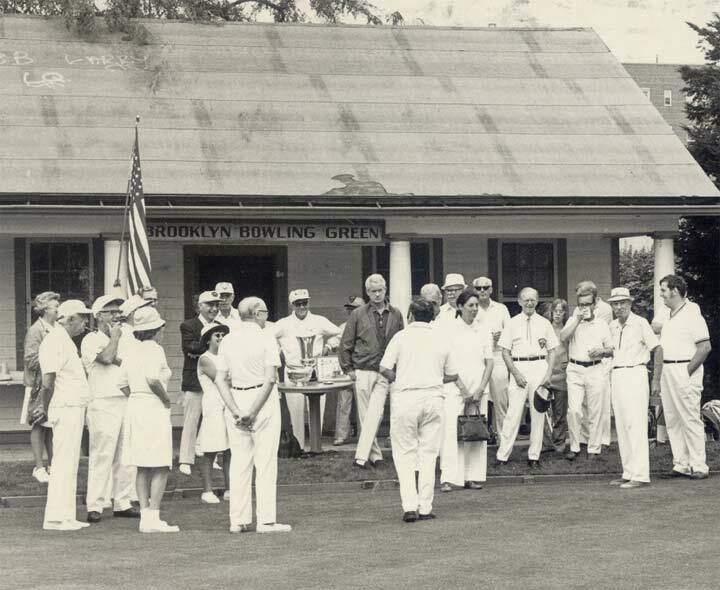 In 1933 the bowlers were given a cottage, a modest wooden shack that appeared reminiscent of the colonial period. By the middle of the century the same preference for modernism that brought down the old Penn Station and Singer Tower also destroyed the Athletic Building. Plans for its replacement first appeared in Brooklyn Daily Eagle in 1948, without any hint of protest. The imminent departure of the Brooklyn Dodgers in 1957 inspired Brooklyn Borough President Abe Stark to propose Parade Ground as a baseball stadium site. In a rare moment of agreement, Parks Commissioner Robert Moses and team owner Walter O’Malley rejected the idea. In 1962, the old Athletic Building was demolished in 1962 in favor of a boxy concrete structure that is divided between Parks offices and the NYPD. Hidden by trees, it is unseen from the street, and better off replaced by something more worthy of this historic park. 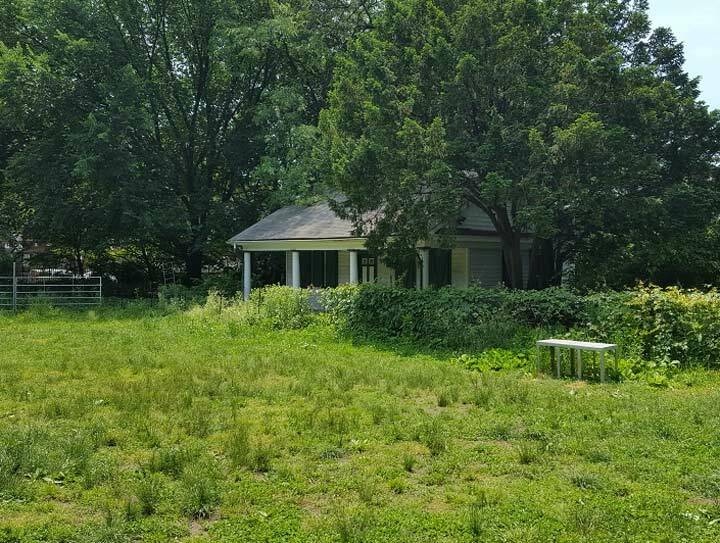 The Bowling Green Cottage has not hosted a lawn bowling game in decades, its lawn used more recently as a pony riding circle, with offices inside the cottage. My initial thoughts of it as a colonial farmhouse or countryside bungalow were wrong. 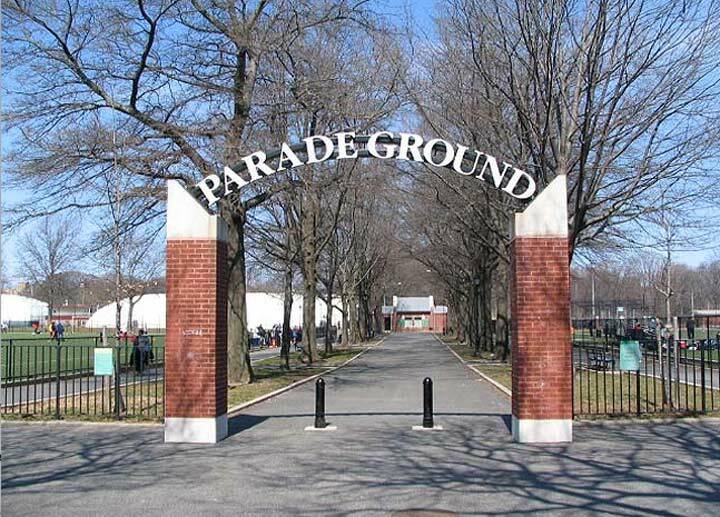 In 2004 the Parade Ground was updated through the efforts of Prospect Park Alliance. 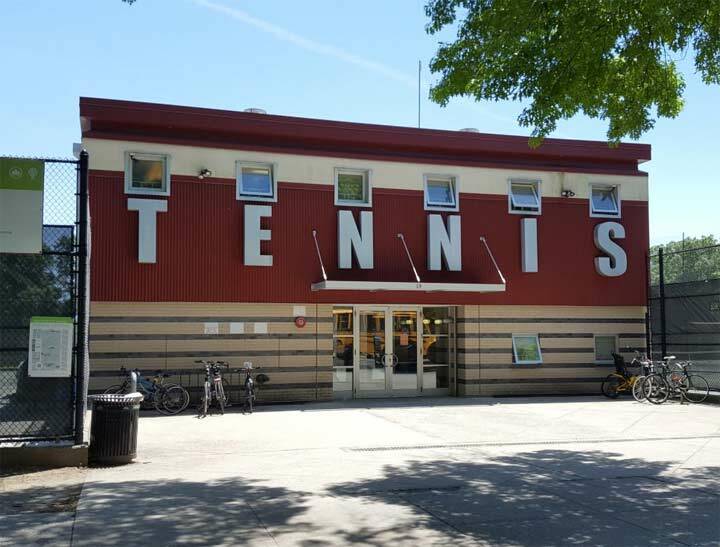 A new tennis center opened on Parkside Avenue, along with decorative gates at entrances to this green superblock. Looking at Parade Ground in this century, it does not feel like a giant field. 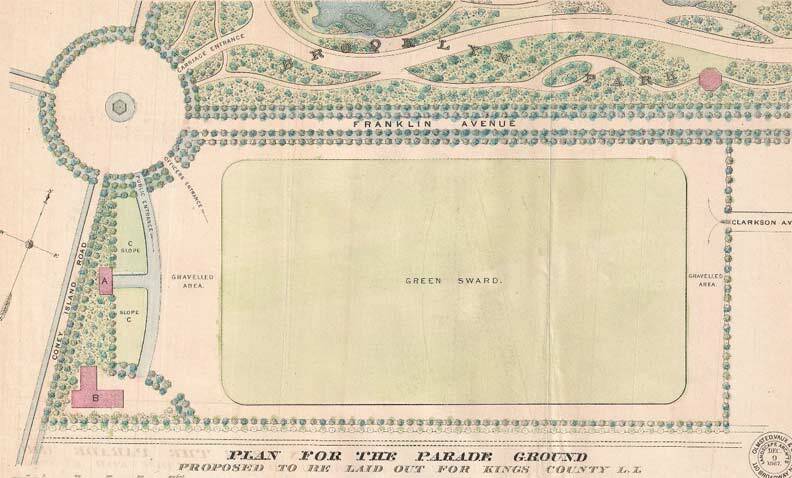 Where there were once a dozen baseball diamonds on one large field, today paths lined by rows of trees divide Parade Ground into four quadrants. On its southeast corner is Det. 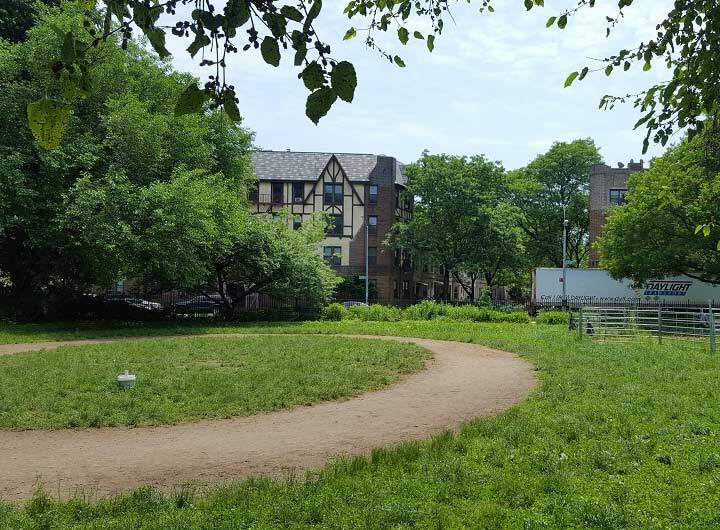 Dillon Stewart Playground for children and a recently-designated dog run at Kermit Place. Where uniformed men and the boys of summer once ran has become a park for all ages, sports types, and pets. With the beaux arts Tennis House in Prospect Park now used as offices, the new Tennis House offers a post-modern look with each letter placed below a corresponding window. 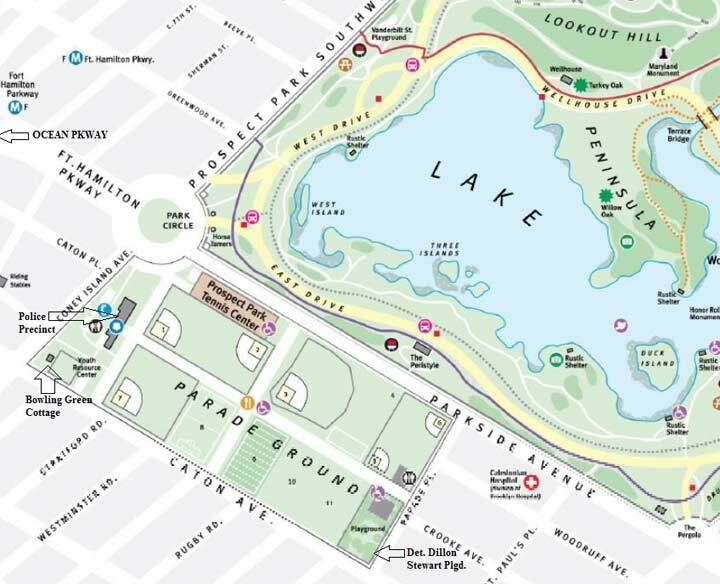 Kevin Walsh explored the surroundings of Parade Ground in 2012 with an in-depth survey of Kensington’s short streets to the west; Prospect Park South in 2009, the Secrets of Prospect Park in 2005 and the bridges of Prospect Park in 2001, when this website was in its infancy. It took a generation between Kevin’s first published page on Prospect Park and this page on Parade Ground. And when we thought that we’ve seen everything in Prospect Park, there’s always new material to share. 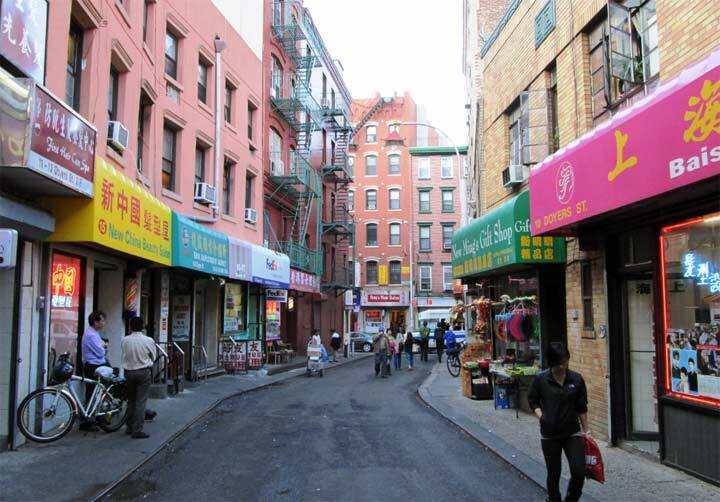 Franklin Avenue is now Parkside Avenue (Fort Hamilton Parkway was also part of Franklin Avenue); Ninth Street is now St. Paul’s Place. The Brooklyn Zoo, The Botanical Gardens. The old Bond Bread Bakery on Flatbush and Empire Blvd. Once Upon a Time (Ebbets Field on Mc Kenzie St Sullivan Place Bedford Ave and Montgomery Street. Great piece. Suggest a mention of one of the original uses of the Parade Grounds as a training destination of the U.S. Army based in Fort Hamilton (1826) to the south. The Fort was connected directly to the Grounds by a 5 mile route that is modern day Fort Hamilton Parkway. Excellent story that brings back memories. On weekends in the late 50’s, many of the ball fields were in use from early morning to late afternoon. One game would end and you could walk over to another field and enjoy another few hours. if I recall correctly there may have been a total of 8 fields. Some very good players and teams. I wonder if is true that Joe Torre played there for a few years. As I was not good at baseball, I could only dream of playing on a team on those fields. And the Franks were better than what was served at Ebbits Field, which I think you walk to in less than 30-minutes.